As we approach the 2012 election season, all voices will converge on a single issue and this time that issue will undoubtedly be the economy. All candidates (regardless of party affiliation) will tout their ability/plan to fix what is broken and make it stronger than ever before. But what are we really talking about here? It might be a good time to understand (albeit at an elementary level) the magnitude of numbers and the implication they may have. Receipts: Our government earns its revenue by collecting various taxes. These include individual taxes that you and I file, corporate taxes from companies, payroll taxes from employers, excise taxes which are paid on goods sold or made for sale and other miscellaneous taxes. Collectively, this income for the government is referred to as Receipts. 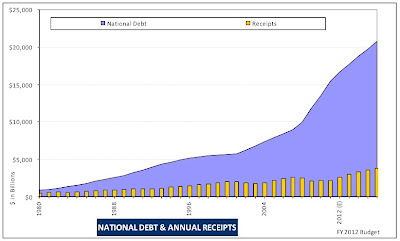 National Debt: In case you were wondering how our government would spend more than it earns, the answer is quite simple. Like the rest of us, our government goes to a bank of sorts and borrows money with a promise to pay interest annually and the principal back at some point of time. This loan or borrowing is our national debt. It is important to note the link between deficits and debt. Not unlike any average household, when you have a deficit you are forced to borrow and create a debt. Now, as each year goes by, any further deficit you might have will lead to a further borrowing or, in other words, will increase the debt. In our case, this has been a cycle of enormous proportions and the current debt is about $15 trillion ($15,000,000,000,000). How much is this really? Look at it this way. Every single person in the US owes about $5 million each!! The Office of Management and Budget (OMB) at the White House maintains historical records of a lot of statistics. I have used some of their data to create some historical charts which help us understand the changes that have taken place over the past few decades. The data is from the 2012 proposed budget and provides the current government's estimates for the next 5 years. 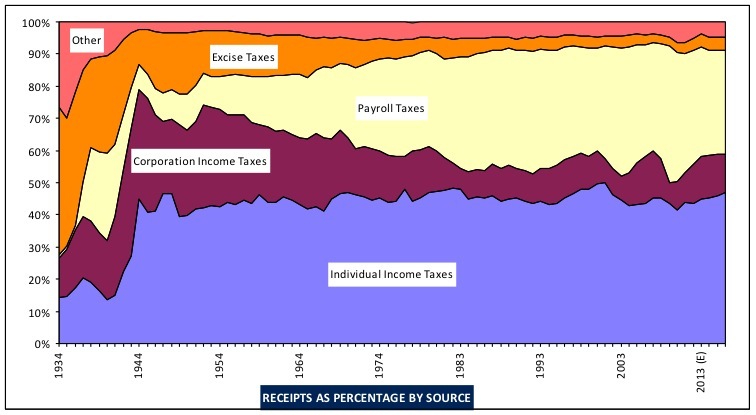 There was a time when the bulk of the government's income came from corporation and excise taxes. This means that during that period, American companies were doing quite well and paid taxes on their earnings. Also, the excise tax indicates that a lot of the production was domestic. As we look down the time-line, production gets outsourced and excise taxes shrink as a percentage of total. As companies set up off-shore tax shelters, the corporate income taxes shrink as well. Currently, the largest portion of the government's income is from the taxes that you and I file, along with the payroll taxes our employers file on our behalf. It is interesting to note the dramatic decrease in corporate taxes. Over the years, corporations have lobbied with politicians to claim and retain tax breaks and the impact is evident in the chart above. So, where does this money that is collected go? The general impression that an average layperson carries is that the government spends most of the money collected on defense to protect our interests. This was true about 50 years ago when most of the spending was indeed on defense. However, in the recent past, this spending pattern has shifted. The largest draw on the receipts is no longer defense but mandatory spending such as Social Security, Medicare/Medicaid. As the economy sputters, this spending increases further as more and more people seek government aid. The other portion that is projected to increase in the coming years is Net interest. Remember the Debt that we talked about? Well, we have to pay it back, at least the interest on it. As the deficit grows, we borrow more. As we borrow more, we have to pay more in annual interest payments. 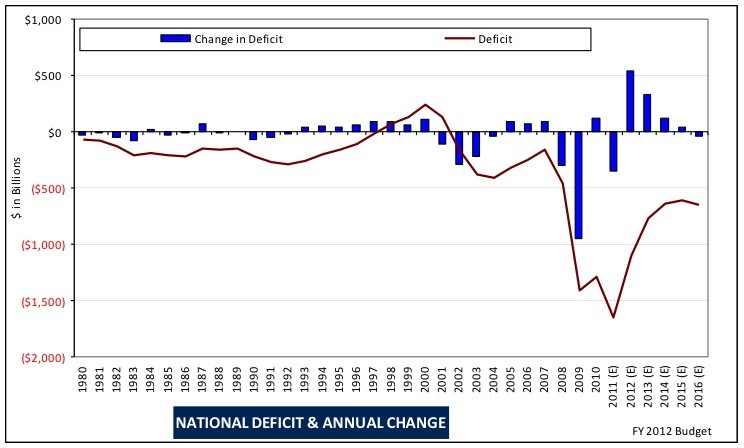 The US has always operated with a deficit, as it is seen in the chart. However this deficit, or shortfall between receipts and outlays, has been relatively small. In fact, during the late 90s, US enjoyed a surplus for a few years. But in the recent past, the spending has increased drastically in relation to the receipts. In the last 5 years, the deficit has more than doubled. To put it in perspective, the "war on terror" had a smaller impact on the deficit compared to the housing crisis of 2008. As of today, the deficit is around $15 trillion. I remain doubtful about the current government's projection of the deficit being reduced to half in the next 3 years. I am sure it is a noble intention but unfortunately not very realistic. Originally, I had tried to look at the debt over a longer period but in that chart, the debt line looked like a hockey stick! I have added the annual income (or receipts) to put the debt in perspective. Currently our debt is running about 7 times our annual income. While this sounds bad enough, let's try to put this in perspective. If this were a housing loan (mortgage) at 5%, then the $15 trillion house would need an annual payment of $1B. Or in other words, 45% of your annual income would need to go towards your house payment. And if you were committed and able to do so then in 30 years, you would own your house. Unfortunately, this house seems out of reach right now. Well, what can be done about this now? Obviously, the two fundamental courses of action are reducing outlays or spending and increasing receipts. Both are easier said than done given that this lifestyle has become a habit. Reducing expenses would mean some sort of austerity measure on mandatory programs such as Social Security and Medicare. Increasing receipts would mean an increase in taxes in some form: individual, corporate or both. None of these choices is easy to swallow but this ailment will not be cured without strong medicine. So, as we prepare for the onslaught of perfect solutions from candidates (incumbent and aspiring alike), it might be worth our while to keep in mind the severity of the problem and how important it is for our future to solve this issue. After all, if the deficit is not curbed then we need to keep borrowing more and increase the debt. At some point of time, the debt grows so large that you cannot afford to pay back the debt. There is a term for this situation: bankruptcy. Deep, thanks so much for this cogent and thorough analysis, it really made a lot of things clear to me. One thing I have never been able to get a clear answer to is: what happened to the Clinton "surplus?" While the "War on Terror" has been cited as a factor in the increase of the deficit, what people seem to forget is that on September 10, 2001 the surplus had not only disappeared but we were again into deficit spending. As far as I can see on your graphs there is a correlation to the decrease in receipts in corporate taxes for the same time.Am I reading your info correctly on that? While you are being very diplomatic towards your conclusion that "none of these choices are easy to swallow" I tend to disagree - what would happen if the corporate taxes were restored to pre-Bush levels? And, what would happen if the income tax breaks for the uber-wealthy (the Paris Hilton bill) were rolled back to pre-Bush levels? Do you have any projections on this? The mantra for corporate tax breaks has been that this money increases domestic production of jobs which increases personal income tax receipt, and excise receipt while lowering unemployment outlay; yet, this clearly has not happened. The mantra for personal income tax breaks has been that this increased domestic spending creating a robust economy; this hasn't seem to have happened either. In your opinion, what would be the effects rolling back the breaks and restoring pre-Bush levels? P.S. Truly excellent post! I'm passing it along, thanks again! Thanks, Shari. My goal was to raise some awareness on this issue and your questions certainly take this discussion to the next level. You are right in saying that the surplus was already dwindled away by 2001. I haven't looked closely enough to determine whether it was entirely due to corporate tax breaks or partly also due to increased spending. If corporate taxes are raised, companies will try to maintain profits by trimming benefits, jobs, etc. Keep in mind that corporations are expected to post profits that improve year over year. Failure to do so leads to depressed stock prices and that in turn hurts the average investor as well (401-k, etc.). All in all, it won't be easy for sure. I was planning on looking at taxes collected by the government and analyze how much is collected from the top earners and so on. But I felt that it would have to be another post. I will try to see what I can come up with. Perhaps I can find something on the effects of restoring the tax-breaks. The tax-breaks could have had a favorable impact if our economy was not extended beyond our borders. When goods production and services are outsourced, they might no longer be part of the economy that is being stimulated. The breaks lose their intended purpose when outsourced goods and services rely on incentives from other economies viz. China. Thanks again for your kind words and feel free to share! If I can inform one more person about this then my purpose is served. Welcome to my blog where I share my take on life, books, movies, etc. This site serves as an online log of my thoughts and interests in case someday my children might be interested in my two cents' worth. While my target audience (my two boys) is not quite ready to read it yet, any visitor here is welcome to peruse and offer feedback. Comments are not only welcome but strongly encouraged. Please be candid as well as civil in your feedback.